It seems like everywhere I go lately there’s a pumpkin pie in the shopping cart next to me, headed home with a shopper to be sliced up and served smothered warm with a scoopful of whipped topping or cold from the fridge the next morning. 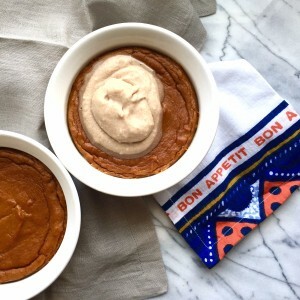 While I can’t just grab a pie and a tub of whipped cream from the store, I wanted a quick and easy treat that satisfied my craving for pumpkin pie without compromising my diet restrictions. 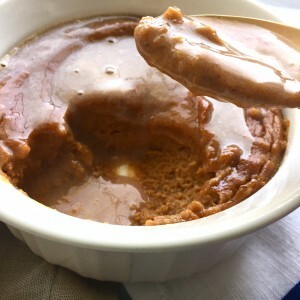 This Pumpkin Custard is ready to put in the oven in less than 5 minutes and is free of grains, dairy, and refined sugar. Serves 2-4 as a custard, or use this as the filling for your favorite crust. Combine all ingredients, and use an immersion blender or mixer to blend til smooth. Scoop into oven safe bowls or ramekins and bake in a 350 degree oven for 20-25 minutes. Take the rest of the chilled coconut cream (about 2/3 c.) out of the refrigerator, and combine with 2 tsp. maple syrup and 1 tsp. cinnamon. Whip til smooth with whisk or immersion blender. Placed on top of the hot custard it will melt quickly but taste delicious. Or allow custard to cool before topping. It’s just as good served cold the next day with a cup of coffee since it’s not overly sweet and full of healthy fiber, potassium, iron, vitamins A and E, and a variety of other vitamins and minerals. Be sure to comment below to tell me if you made this, and tag me in your photos on Instagram! I got to make this. Maybe just for the guys/boys right now…. I made this tonight with left over pumpkin and coconut milk I needed to use up, and it was fantastic! I had to bake mine for 30 min, but my oven tends to take longer. This one goes in the keeper file!